Oh the places I find inspiration. When I go to work, I do write down some of the awesome patterns and color combos on my co-workers scrub tops…some of them are used to my routine. Others learn that this is a norm for me. Another place I was just amazed by the color combinations was at Babies R’ Us a couple weeks ago….go check out the bedding/nursery sets and you will see some of the coolest trend-setting combinations out there. STAMP SETS USED: SU! Stitched Exotics, Stitched Background, and All Holidays. CARDSTOCK USED: SU! Shimmery White, Basic Black, Taken with Teal. INKS USED: Stazon Jet Black, Old Olive, Pumpkin Pie, Taken with Teal, and Rose Red. 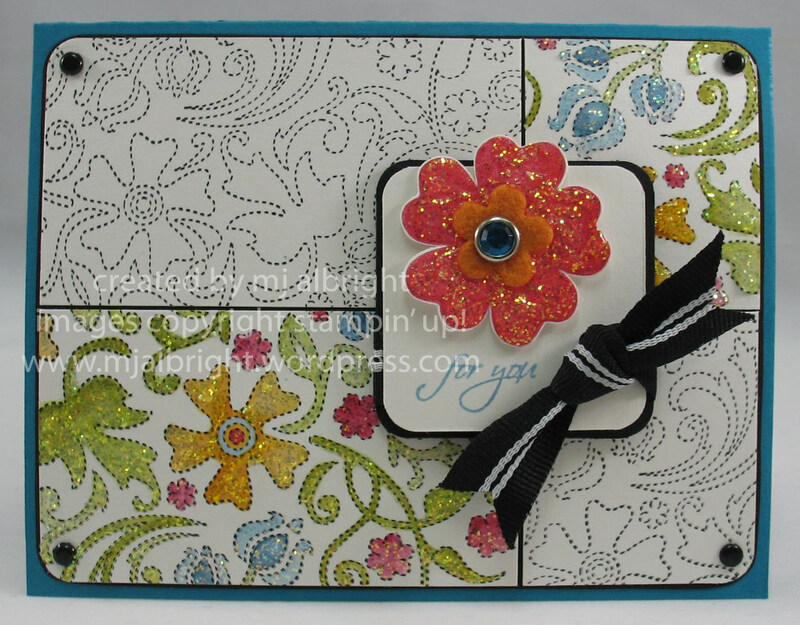 ACCESSORIES USED: Ice Circle Rhinestone Brads, Vintage Brads Assortment, Flower Fusion, Jersey Ribbon Originals, 3/16″ Corner Rounder Punch, Horizontal Slot Punch, Stampin’ Dimensionals, Stickles. Oh how cute, Mary Jo! I LOVE how you only colored in some of the flowers! Very neat idea! Such a SWEET card! What a fabulous idea to color in the Stitched background! It looks terrific! Great card! Oh…MJ, leave it up to you to step that background up a notch! I LOVE the way you colored it. Gorgeous card! Gorgeous, MJ — love the b/w with color added and rounded corners! Great job with the challenge! Oh, my, word! I am dying over this card! My stitched background is on its way, don’t know how I lived with out it this long. Thanks for sharing, I JUST LOVE THIS CARD! That is a very cool card. I love the idea of colouring some, and leaving some black and white. Fantastic! So beautiful! Love the colors and idea! Beautiful card Maryjo, I LOVE how you used the BG stamp. colored them in and added some fun sparkle. Great card as always! I really like this background stamp, and love how you have used it. The way you have done the coloured section is so pretty. Lovely card. I am always amazed at the creative ideas you come up with!! Thank you so much for sharing about how you are inspired!! I need to start paying attention to things around me more! 🙂 The underlying black and white theme with some color added in is just gorgeous…and then you added sparkle! Yum! Wow, awesome card, Love how you colored in the flowers !! What a gorgeous card! I love how you colored only parts of it! Beautiful! Yep, another beauty!! This is gorgeous, MJ! Love that coloring and the glitter! Beautimous!!! mwah! OMGosh MJ!! This is beautiful. I have that bg stamp and have never used it. I think I might be coloring it in verrrrryyy soon!! Thanks for sharing an amazing idea. Go scrubs!! MAN OH MAN!!!!!!!! THIS IS GORGEOUS!!!! beatutiful! I love the way this turned out and the sparkles are amazing! Love the look of b&w, mixed with the color, the stickles gives them a neat touch too! Mary Jo…I have never seen or thought to colour this stamp in…but OH, I can’t wait to try! You always share such cool ideas! WOW, this card is awesome, such a nice contrast between the black & white, and the colored in. Excellent card. Oh, boy… I do not need this background stamp. I do not need this background stamp. Great job using your scrub inspiration! This is so unique and so gorgeous! I love your soft coloring and the contrast with the b/w. TFS! Regardless of why we’ve lost our hair, the general public assumes we are sick. folding tables come with a twelve year factory guarantee. rated peak in mind. FOOD FOR THOUGHT: Want to find out the underlying influence in a situation. A head scarf can indeed be more than just something fashionable or traditional.